. . . my work, which I've done for a long time, was not pursued in order to gain the praise I now enjoy, but chiefly from a craving after knowledge, which I notice resides in me more than in most other men. And therewithal, whenever I found out anything remarkable, I have thought it my duty to put down my discovery on paper, so that all ingenious people might be informed thereof. Antony van Leeuwenhoek was an unlikely scientist. A tradesman of Delft, Holland, he came from a family of tradesmen, had no fortune, received no higher education or university degrees, and knew no languages other than his native Dutch. This would have been enough to exclude him from the scientific community of his time completely. Yet with skill, diligence, an endless curiosity, and an open mind free of the scientific dogma of his day, Leeuwenhoek succeeded in making some of the most important discoveries in the history of biology. It was he who discovered bacteria, free-living and parasitic microscopic protists, sperm cells, blood cells, microscopic nematodes and rotifers, and much more. His researches, which were widely circulated, opened up an entire world of microscopic life to the awareness of scientists. Leeuwenhoek was born in Delft on October 24, 1632. (His last name, incidentally, often is quite troublesome to non-Dutch speakers: "layu-wen-hook" is a passable English approximation.) His father was a basket-maker, while his mother's family were brewers. Antony was educated as a child in a school in the town of Warmond, then lived with his uncle at Benthuizen; in 1648 he was apprenticed in a linen-draper's shop. Around 1654 he returned to Delft, where he spent the rest of his life. He set himself up in business as a draper (a fabric merchant); he is also known to have worked as a surveyor, a wine assayer, and as a minor city official. In 1676 he served as the trustee of the estate of the deceased and bankrupt Jan Vermeer, the famous painter, who had had been born in the same year as Leeuwenhoek and is thought to have been a friend of his. 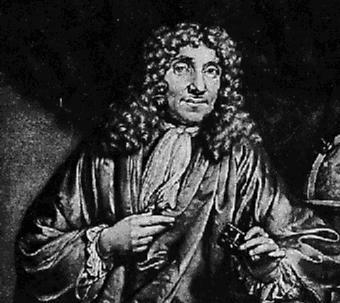 And at some time before 1668, Antony van Leeuwenhoek learned to grind lenses, made simple microscopes, and began observing with them. He seems to have been inspired to take up microscopy by having seen a copy of Robert Hooke's illustrated book Micrographia, which depicted Hooke's own observations with the microscope and was very popular. Leeuwenhoek is known to have made over 500 "microscopes," of which fewer than ten have survived to the present day. In basic design, probably all of Leeuwenhoek's instruments -- certainly all the ones that are known -- were simply powerful magnifying glasses, not compound microscopes of the type used today. A drawing of one of Leeuwenhoek's "microscopes" is shown at the left. Compared to modern microscopes, it is an extremely simple device, using only one lens, mounted in a tiny hole in the brass plate that makes up the body of the instrument. The specimen was mounted on the sharp point that sticks up in front of the lens, and its position and focus could be adjusted by turning the two screws. The entire instrument was only 3-4 inches long, and had to be held up close to the eye; it required good lighting and great patience to use. Compound microscopes (that is, microscopes using more than one lens) had been invented around 1595, nearly forty years before Leeuwenhoek was born. Several of Leeuwenhoek's predecessors and contemporaries, notably Robert Hooke in England and Jan Swammerdam in the Netherlands, had built compound microscopes and were making important discoveries with them. These were much more similar to the microscopes in use today. Thus, although Leeuwenhoek is sometimes called "the inventor of the microscope," he was no such thing. However, because of various technical difficulties in building them, early compound microscopes were not practical for magnifying objects more than about twenty or thirty times natural size. Leeuwenhoek's skill at grinding lenses, together with his naturally acute eyesight and great care in adjusting the lighting where he worked, enabled him to build microscopes that magnified over 200 times, with clearer and brighter images than any of his colleagues could achieve. What further distinguished him was his curiosity to observe almost anything that could be placed under his lenses, and his care in describing what he saw. Although he himself could not draw well, he hired an illustrator to prepare drawings of the things he saw, to accompany his written descriptions. Most of his descriptions of microorganisms are instantly recognizable. In 1673, Leeuwenhoek began writing letters to the newly-formed Royal Society of London, describing what he had seen with his microscopes -- his first letter contained some observations on the stings of bees. For the next fifty years he corresponded with the Royal Society; his letters, written in Dutch, were translated into English or Latin and printed in the Philosophical Transactions of the Royal Society, and often reprinted separately. To give some of the flavor of his discoveries, we present extracts from his observations, together with modern pictures of the organisms that Leeuwenhoek saw. In a letter of September 7, 1674, Leeuwenhoek described observations on lake water, including an excellent description of the green charophyte alga Spirogyra: "Passing just lately over this lake, . . . and examining this water next day, I found floating therein divers earthy particles, and some green streaks, spirally wound serpent-wise, and orderly arranged, after the manner of the copper or tin worms, which distillers use to cool their liquors as they distil over. The whole circumference of each of these streaks was about the thickness of a hair of one's head. . . all consisted of very small green globules joined together: and there were very many small green globules as well." A letter dated December 25, 1702, gives descriptions of many protists, including this ciliate, Vorticella: "In structure these little animals were fashioned like a bell, and at the round opening they made such a stir, that the particles in the water thereabout were set in motion thereby. . . And though I must have seen quite 20 of these little animals on their long tails alongside one another very gently moving, with outstretched bodies and straightened-out tails; yet in an instant, as it were, they pulled their bodies and their tails together, and no sooner had they contracted their bodies and tails, than they began to stick their tails out again very leisurely, and stayed thus some time continuing their gentle motion: which sight I found mightily diverting." On September 17, 1683, Leeuwenhoek wrote to the Royal Society about his observations on the plaque between his own teeth, "a little white matter, which is as thick as if 'twere batter." He repeated these observations on two ladies (probably his own wife and daughter), and on two old men who had never cleaned their teeth in their lives. Looking at these samples with his microscope, Leeuwenhoek reported how in his own mouth: "I then most always saw, with great wonder, that in the said matter there were many very little living animalcules, very prettily a-moving. The biggest sort. . . had a very strong and swift motion, and shot through the water (or spittle) like a pike does through the water. The second sort. . . oft-times spun round like a top. . . and these were far more in number." In the mouth of one of the old men, Leeuwenhoek found "an unbelievably great company of living animalcules, a-swimming more nimbly than any I had ever seen up to this time. The biggest sort. . . bent their body into curves in going forwards. . . Moreover, the other animalcules were in such enormous numbers, that all the water. . . seemed to be alive." These were among the first observations on living bacteria ever recorded.
. . . Antony van Leeuwenhoek considered that what is true in natural philosophy can be most fruitfully investigated by the experimental method, supported by the evidence of the senses; for which reason, by diligence and tireless labour he made with his own hand certain most excellent lenses, with the aid of which he discovered many secrets of Nature, now famous throughout the whole philosophical World.